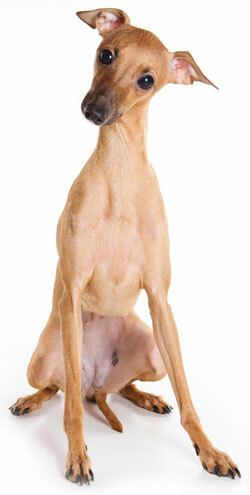 The Italian Greyhound is an active yet peaceful, gentle, loving, sensitive and devoted companion. He needs to be physically close to you and will sleep in your lap or on your bed. He needs a great deal of love and attention. He is very dependent on his owner and family and should not be left alone for too long. He is a gentle and submissive dog who can sometimes be timid or tense--but he's also playful, and prone to sudden bursts of energy. He loves to run around the house! He is an indoor dog but also needs regular outdoor exercise, like a daily walk. He should always be walked on a leash because he will chase after any small animal that moves. He also loves to jump and climb, and should be watched closely so that he doesn't escape or hurt himself. He is polite with people but can be nervous or easily startled by strangers or strange situations, and he prefers calm in the home. He is good with other dogs, cats and pets if he lives with them in a calm setting. He is a fairly good watchdog, because he will bark at unfamiliar sounds, although he is quickly spooked by a new face. He gets along well with children as long as they are calm and considerate of him. He is not easy to train. He is sensitive and needs constant reassurance that he is doing well; sometimes he finds training uninteresting and prefers his own mischief and fun. You will need to be patient and consistent to teach him. He is difficult to housebreak. He is sensitive to cold and will need a sweater when out during the colder months. He is a low-to-medium shedder, and might not be a good pet if you are worried about some dog-hair in the house. The Italian Greyhound is 13 to 15 inches tall (to shoulders) and weighs 7 to 14 pounds. He has a short, smooth coat. His coat color can be black, blue, fawn, red, gray, white or a combination of two colors. You only have to brush him occasionally. The Italian greyhound is a very old breed, and can be found in examples of Mediterranean art that are over 2,000 years old. He was probably brought by the Phoenicians to Europe during the Middle Ages, and by the 16th century was very popular with the nobility of Italy and Southern Europe. He was registered with the AKC in 1886. During the First World War the breed nearly went instinct, but dogs from America helped to rebuild his bloodlines. The Italian Greyhound Club of America was founded in 1954. His AKC popularity was 59th out of 157 breeds in 2007.